St. Louis is coming closer to what Cincinnati did in 1995. 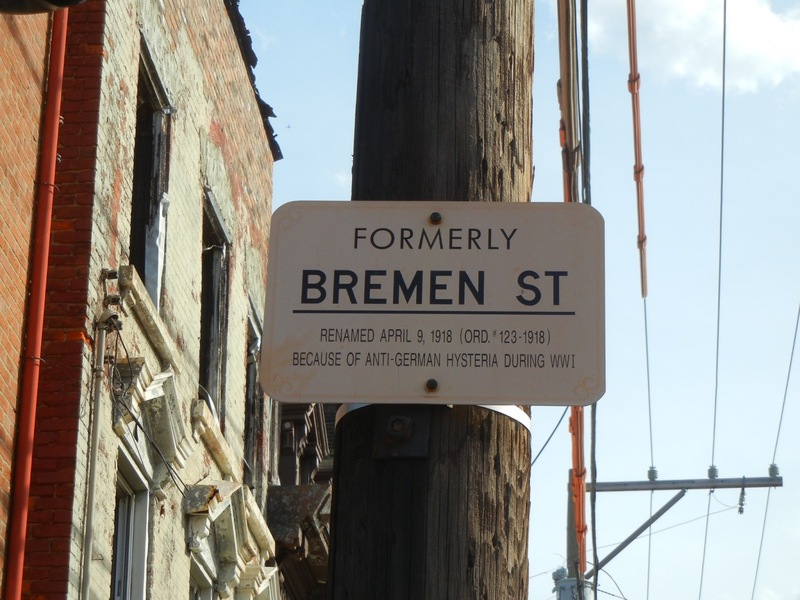 That year, the city placed markers like the one above noting the original German names of 12 streets that were Anglicized during the anti-German hysteria of World War I. On Thursday, the Board of Aldermen’s Streets, Traffic and Refuse Committee approved a bill establishing an honorary designation of Providence Place as Knapstein Place. Knapstein was its name before it was changed during the anti-German hysteria. It’s a one-block street on the east side of the historic German St. Anthony of Padua Catholic Church. But it’s a good start as we move toward an honorary designation or marker for the six St. Louis streets whose names were changed during World War I. The bill sponsored by 20th Ward Alderman Craig Schmid goes to the Board of Aldermen for today for the first of two votes, and then to Mayor Slay for his approval. I spoke in favor, as did local German Honorary Consul Lansing Hecker and James Martin, president of the German-American Heritage Society. St. Louis Post-Dispatch columnist Bill McClellan was there, and will file a story for Monday’s paper. The street will keep the official name of Providence Place, but will have an honorary sign giving the name Knapstein Place in German colors. Thursday ended on a high note, when the Princeton Heights Neighborhood Association voted to endorse our efforts to give the honorary designation of Kaiser Street at Gresham Avenue on Kingshighway Boulevard near Gravois Avenue and Cecil Place as Hapsburger Avenue.